There is no match in the CIS for the dynamic duo of Gabrielle Davidson and Katia Clement-Heydra. Davidson, a sophomore winger exploded for a total of five goals and an assist, while Clement-Heydra, a senior centre scored two goals and added five assists, leading the no. 1 ranked Martlets (7-0) in back-to-back victories over Concordia (1-5) and NCAA opponent St. Lawrence at McConnell Arena this weekend. The Concordia matchup on Friday night was a thoroughly one-sided affair, much like the past 50 encounters between the two teams—all McGill victories. Following a fruitless first period in which the Martlets tested the Stingers with 16 shots on goal, Clement-Heydra opened up the scoring just 30 seconds into the second stanza. Concordia responded minutes later, but Davidson soon put the game out of reach, registering three goals in under six minutes. Clement-Heydra finished the job with another tally in the third, bringing her point total for the game to five to seal a 5-1 Martlet victory. Davidson’s hat-trick was enough to put her atop the CIS leaderboard in goals scored despite playing in five games fewer than the next highest scorer. 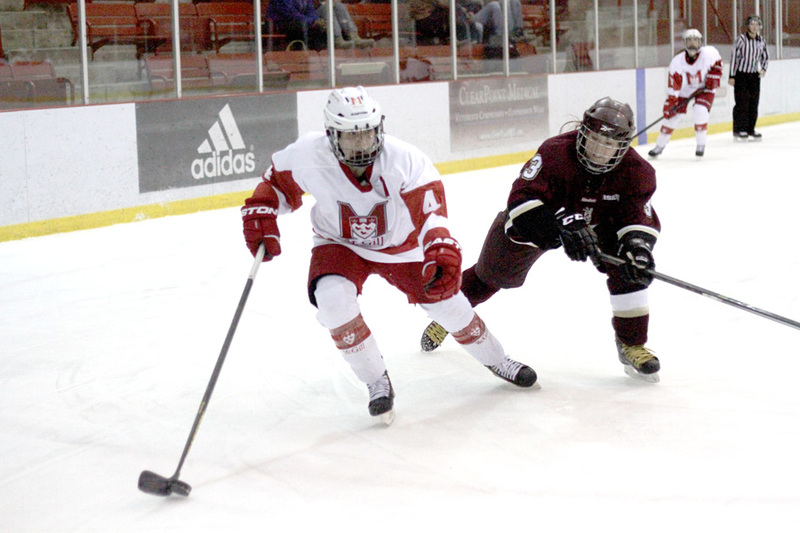 Saturday afternoon’s showdown with the St. Lawrence Saints proved to be a greater test for the Martlets, who had to rally from behind to seize the 3-2 victory in the dying minutes of the game. The Saints, who sit in fifth place with a 4-2 record in the NCAA’s ECAC division, came out strong and jumped to a 2-0 lead early in the second period. McGill began its comeback with a timely goal from Davidson, but despite sustained pressure, was unable to strike again for the remainder of the period. Down by a goal at the second intermission, Martlet Head Coach Peter Smith urged his team to carry its momentum into the third period. Once again, Davidson obliged, tying the game on a low shot from the bottom of the faceoff circle just 14 seconds after the opening draw. The deciding marker took a bit longer to materialize, but it arrived just in time. With only a minute-and-a-half left in regulation, Leslie Oles neatly deflected a saucer pass from Davidson into the top corner, before crashing into the net herself. The speedy fourth-year was slow returning to her feet, though Smith later confirmed that she had not sustained any serious injury on the play. The Martlets were able to hang onto the lead to clinch the 3-2 victory, a retributive result for the team after last year’s 5-4 overtime loss to the Saints. This was the seventh of McGill’s eight matchups with NCAA teams scheduled for this season, of which they have won four. Smith praised his team’s ability to come away with the win in a very close game. “We’ve had a couple games this year that we ended up losing that I thought we should have won—the Providence and Northeastern games come to mind—and today I thought we deserved to win,” he said. Although they do not count towards RSEQ standings or CIS rankings, the Martlets prepare for these exhibition matches against American foes as they would any other, and see them as an opportunity for growth, especially considering their dominance against conference opponents. The Martlets will look to build on this weekend’s momentum next Saturday in Ottawa where they will take on the Gee-Gees (5-3), before returning home to host the Montreal Carabins (4-2) at 7:00 p.m. on Sunday, Nov. 24.